At every diving industry show, a few companies and individuals push the envelope of every aspect of diving, and Boot Düsseldorf 2017 was no exception. Deepblu went sniffing around the booths in search for interesting new developments. 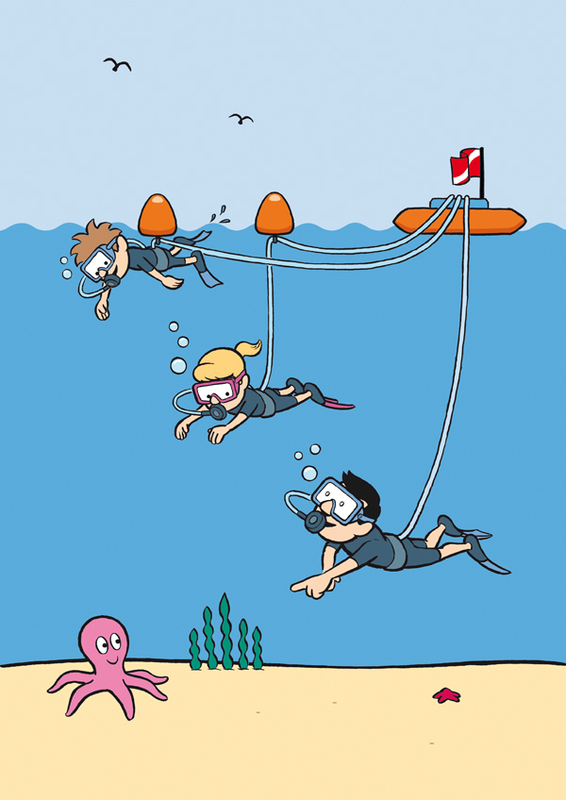 Today we’d like to present STEPDive, a system and method to teach kids of age five and up in the ways of the diver. If you are a parent of young children, you have probably noticed that your holidays are not the same anymore. And this is no exception for divers, who often end up feeling like beached whales, pining for the ocean and the day their children grow up. But what if we told you your five-year old can go scuba diving? Tiemen van Dillen, a migratory Dutchman now residing with his family in Austria, found just the way to initiate his own children of 5, 8 and 11 to open-water scuba diving without having to spend his holidays at the swimming pool. His company Snorkel Dive Innovations created STEPDive, a diving system and method designed for maximum safety and comfort. 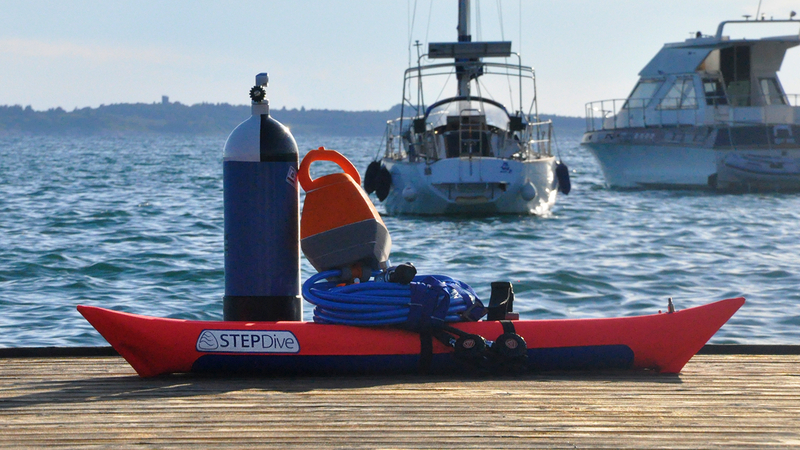 Reminiscent of a hookah, the STEPDive consists of an inflatable pontoon able to carry a scuba tank and some extra gear, as well as respirators, thick PVC tubes and bright orange buoys. 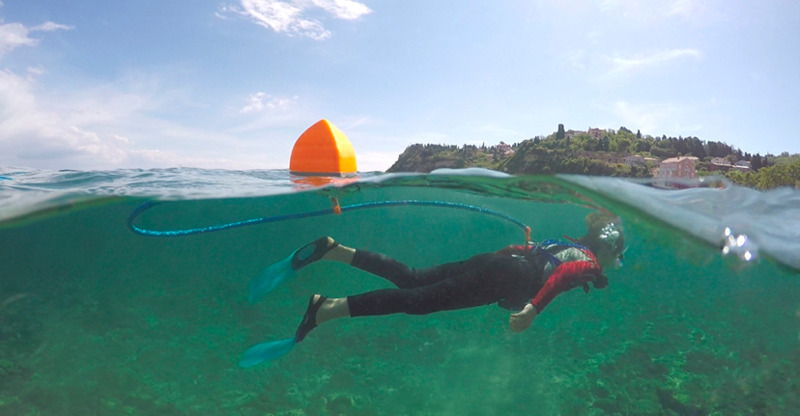 Rather than carrying encumbering equipment such as BCDs and personal scuba tanks, both the child and the adult receive a single respirator connected to the tank on the pontoon. The adult can easily adjust the tube to allow depths of 0–5 meters (0–16.4 feet) depending on the skill level of the child. The tube itself is attached to the child’s back, preventing the respirator from being yanked out of the child’s mouth. The STEPDive will be commercially available in April/May with preorders starting in late March. The retail price of €800–900 will get you a set for two users which comes with a handy carrying case optimized for travel. For more info, check out the Snorkel Dive Innovations website.